Front row (left to right): Kathy Odell, Life Achievement; Ali Bauerlein, Medical, Science & Technology, and Melissa Marsted, Communications, Marketing & Publishing. 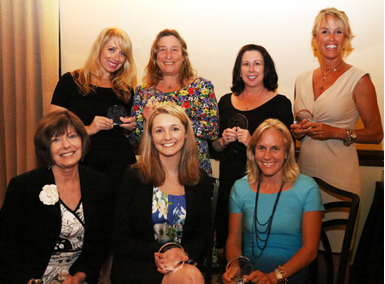 Back row: Jill Latham, Emerging Business; Susanne Chess, Retail, Wholesale, Manufacturing; Barbara Klein, Professional Services; Joy Kelly, Beauty & Fitness. Not shown: Alethea Tyner Paradis, Tourism & Hospitality. *Open to any professional in accounting, law, real estate, consulting, etc. Feldman points out that the selection of the winners will be done by “independent judges who are not connected with the Foundation and do not live in Santa Barbara to preserve the integrity of the Awards.” The top three nominees in each category will be recognized, but the winners will not be announced until the dinner at the Fess Parker Resort on May 9, just like the Oscars. Lynda Weinman, co-founder/executive chair of lynda.com, will be the MC for the event. Proceeds from the Spirit of Entrepreneurship Awards benefit the student winners of the SBCC Scheinfeld Center’s New Venture Challenge, a two-tiered business pitch competition for area high school and collegiate students that promotes youth entrepreneurship. The winners of both tiers of the New Venture Challenge Awards willbe the Foundation’s guests and receive their prizes at the Spirit of Entrepreneurship Awards dinner.